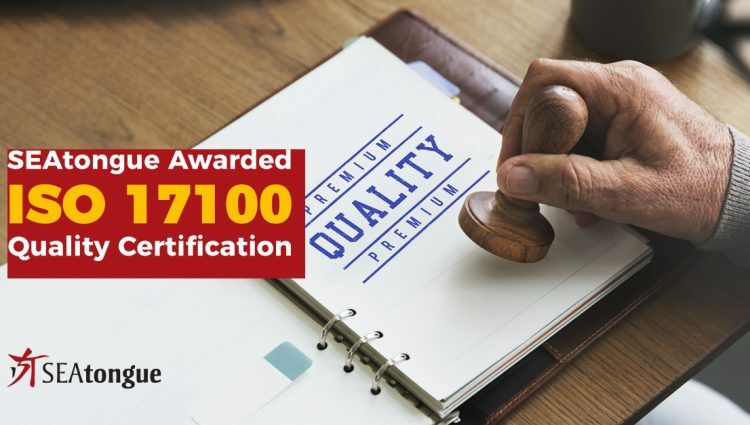 SEAtongue, a key player in the Asian translation industry, is proud to announce that it has achieved ISO 17100 certification from the leading International Testing Organisation, following an independent audit. The latest development confirms that the company has met uniform global standards for its translation services and certifies its first-class approach for quality of service, delivery requirements, translator evaluation and producing superior translated content for its clients. SEAtongue is proud to have successfully passed these stringent auditing procedures and is confident that the certification will bolster continued growth across its client base from 2018 onwards. The new certification confirms the company as an established global player in the world of technical translation and will reassure current and prospective clients that they will receive the very best in Asian translation and localization services. At the heart of any translation service provider are its translators, revisers and proof-readers but the new standard goes beyond this. It also spells out the necessary administrative, technical and IT resources and conditions that directly influence the quality and delivery of translation services. It provides a global standard and replaces the previous European standard for translation services, EN 15038:2006. For clients just entering the overseas markets and companies who appreciate the value of good technical communication in business success, the new ISO standard will allow them to apply a fast and effective initial filter in selecting a foreign language provider to translate their product software and documentation: to only utilize translation services producers that are verified ISO 17100 compliant by an independent standards company. SEAtongue has over 9 years’ experience in delivering high-quality translation and localization services across the world and works with a range of industries and high-profile brands requiring Asian translation services. These include Microsoft, Dell, IBM, Nokia, Samsung, Ford, Honda, BMW, Mitsubishi, Bosch Siemens, Schindler, Epson, Nikon, Toshiba and Sony. The company’s expertise covers a range of industries including telecommunication, automotive, consumer, life sciences, business, manufacturing and many more. The company works with all global markets and its Asian translation and localization services are based in the heart of Asia giving them excellent access to native resources. The company also offers specialist localization elements to its translation services at competitive prices, and at fast turnaround times.